Catch the King Enters Guinness Record Books! In 2014, Wetlands Watch came up with the Sea Level Rise smart phone mapping app to crowdsource flooding information. We had no idea that five years later, through partnerships with energetic people and organizations, we’d be in the Guinness Record Book! Thousands of people joined the effort as we grew this effort over the last two years. 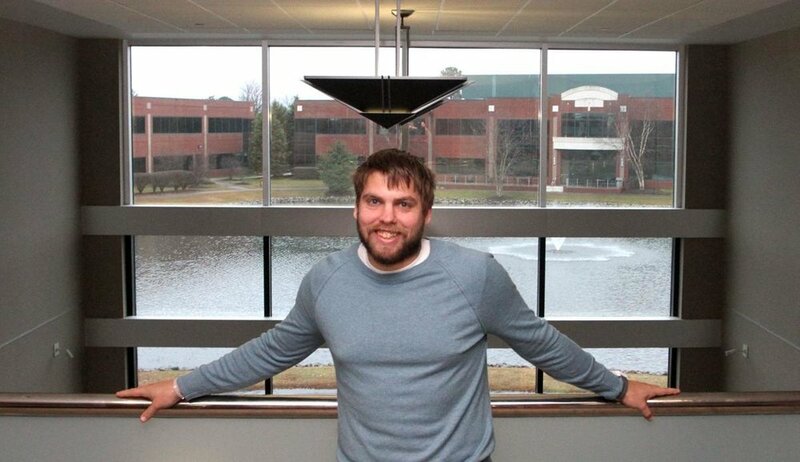 Concursive Corporation, with Dave Richards who built the app, continued to support it as a community service. Dave Mayfield, then with the Virginian Pilot, came up with the “Catch the King” effort that resulted in the Guinness Record. Derek Loftis of the Virginia Institute of Marine Science was the scientific backbone of the work, using the data collected to perfect his flooding models. Karen Jacklich was the organizer for the hundreds of mappers that came to make this whole thing work. This is a marvelous example of how people can come together to deal with the problems we face along the coast. We are so proud to be a part of this. 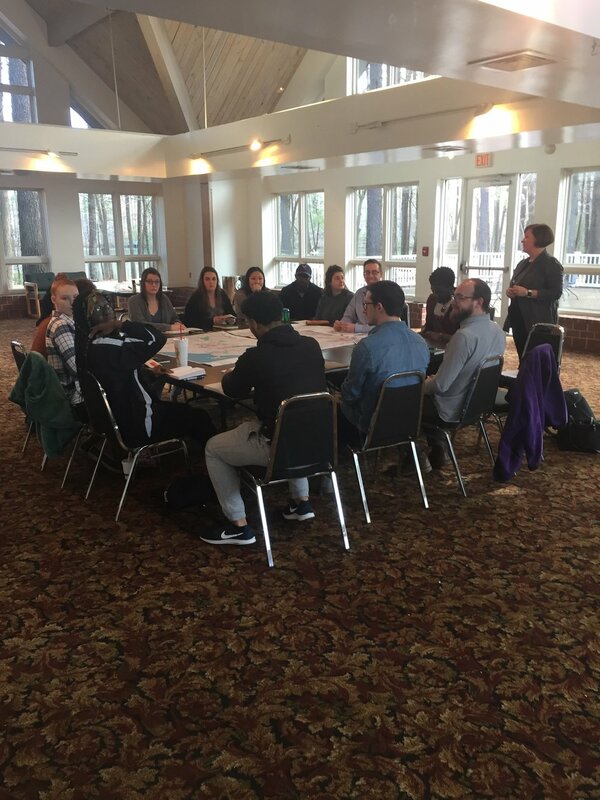 Snapshot: Jori Erdman (formerly with the Coastal Sustainability Studio at Louisiana State University) brought a combined team of students to Hampton, Virginia to work on the Resilient Hampton plan, in partnership with city staff. Jori is teaching an undergrad architecture class at James Madison University and a graduate planning class at University of Virginia. She brought them to Hampton to work on resilient solutions to the flooding on Newmarket Creek. This is another Collaboratory project, where we partner Virginia’s academic institutions with local government resilience needs..
Backstory: Hampton, Virginia, is among the leaders in the nation in developing a plan for addressing flooding, both today’s flooding and tomorrow’s. The work started with the City’s proposal for the National Disaster Resilience Competition (NDRC) in 2015. Part of that process in the Southeastern Virginia region (Hampton Roads region, to be exact) was a four-day design charrette, “Dutch Dialogues-Virginia: Life at Sea Level.” During that process the first conceptual designs were developed to transform the Newmarket Creek watershed from a tortured, flooding, built-over creek to an urban asset. Hampton then continued the work, developing a city-wide resilience plan, “Resilient Hampton.” They developed a more refined plan for Newmarket Creek and took that to the public - listen to a radio feed on meetings. Now Jori Erdman’s students are going to drill down on some of the concepts, developing details on the project but, more importantly, learning the skills they will need as professionals in the future dealing with the impacts of climate change in design and planning. We are so proud to be able to facilitate this process through the Collaboratory. Snapshot: Congress is bringing the Department of Defense into the climate change/sea level rise adaptation game, on and off its bases. Congress has been asking for DoD studies on climate change impacts and this year the DoD Authorization bill has provisions to start spending military funds in the surrounding civilian communities. This puts DoD in the lead in sea level rise adaptation efforts at the federal level. The big question is whether civilian agencies will follow, because DoD can’t do it alone. Backstory: In 2018, Congress asked DoD to take at look at “Climate Related Risk to DoD Infrastructure.” The study found that over 900 military sites have been hit by flooding - from both storm surge and rainfall - over the last 30 years. This includes over 130 navy installations within 2 kilometers of the shoreline. The Study was updated in 2019 and continues to show the vulnerability. This year, in the Department of Defense Authorization law, some significant steps were taken to get military installations working with surrounding communities to deal with climate change and sea level rise impacts and develop more resilient systems in support of those installations. It also set up DoD to be the major federal funder of sea level rise adaptation work in communities around its installations, something that raises concerns. In Public Law 115-232, The “John McCain National Defense Authorization Act of 2019,” there are a number of provisions that put the Department of Defense at the head of federal efforts to address flooding and climate change within it’s operations. At Section 2805 of the law, a new standard for construction of military facilities is laid out. Any construction in a 100-year floodplain has to add 2 feet above the base flood elevation (freeboard) for non-mission critical projects and 3 feet of freeboard for mission critical projects. The law then goes on to require new design modifications for future construction “in order to anticipate changing environmental conditions during the design life of existing or planned new facilities and infrastructure.” Those future environmental conditions will come from, among other places, the U.S. Global Change Research Office and National Climate Assessment. So we have the National Climate Assessment outcomes becoming the driving force for new facilities and infrastructure designs to be developed to address those climate outcomes. This is the first federal program to use future conditions as a driver for its actions and the first federal program that begins to design for the future we are facing. The law then makes threats to military installation resilience eligible for programs within the DoD Office of Economic Assistance, including Joint Land Use Studies, of the kind we are piloting here in Hampton Roads, Virginia. In this section we once again have ground-breaking federal authority to include future conditions in the operation of federal facilities. The National Aeronautics and Space Administration (NASA) and other agencies have voluntarily looked at their facilities in the face of climate change, but this is a legislated mandate that DoD undertake this work. This section also has DoD working jointly with communities surrounding military installations to plan for dealing with future conditions in order to insure the installation is resilient, by itself and in coordination with the surrounding community. Finally, at Section 2865, the law makes roads that lead into installations that flood eligible for DoD funding under the Defense Access Roads Program. The trigger is: "(i) Beginning in fiscal year 2019, funds appropriated for the purposes of this section shall be available to pay the cost of repairing damage caused to, and for any infrastructure to mitigate the risks posed to, highways by recurrent flooding and sea level fluctuation, if the Secretary of Defense shall determine that continued access to a military installation has been impacted by past flooding and mean sea level fluctuation." There is NO civilian agency authority to fund this work, so DoD is now the federal lead agency in planning for and dealing with resilient infrastructure issues in communities surrounding military installations. Together, these new mandates put DoD/base commanders on the hook to help surrounding localities deal with sea level rise and flooding that can affect the operation of a facility. Seems like a logical thing and much needed. But how large is this task? How many billions will it take to make every DoD facility and its surrounding community “resilient” with all the broadly defined “community infrastructure?” The good thing about this is DoD will lead every other federal agency in addressing climate change resilience, and it makes a lie of those in Washington who doubt climate change. The bad thing about this is DoD cannot go it alone and there seem to be no plans to spread the burden across civilian agencies. Adaptation Funding = Speaking of the Virginia Shoreline Resilience Fund, a recent article points out the need to actually fund it, something people are working on during this session of the General Assembly. ARTICLE HERE. Adaptation Action = Many cities in SE Virginia are starting to take action on flooding and sea level rise adaptation. Here is a good review of what the City of Hampton, Virginia is doing. ARTICLE HERE. Adaptation Action = Speaking of taking action at the local/regional level while waiting for the state and federal governments to act…Hampton Roads in Southeast Virginia issued regional guidance for localities to use in planning for sea level rise. This is one of the few actions of this kind taken in the country. A local official declared, “We are at war,” when the measure was approved. ARTICLE HERE. Economic Impacts = Very interesting article looking at the impacts of flooding and flood insurance on declining home values in parts of Norfolk. ARTICLE HERE. Adaptation Policy = While some in Washington (and Richmond for that matter) debate the reality of climate change, coastal Virginia sees that reality and is taking action to deal with it. ARTICLE HERE. Adaptation Acton = It’s an old article but still current, telling the story of the Virginia Barrier islands and how they just missed becoming another Outer Banks. Storms came to discourage development and today these islands are doing their thing - retreating - and one, Cedar Island, shed its last house. ARTICLE HERE. Student Design Project Pays Off in Unexpected Ways - Floating Houses? Snapshot: In a newly inundated environment, we need new approaches, including trying out houses that float! One of our former student partners in the Collaboratory is continuing his innovative design work with a floating house proposal to deal with flooding in coastal Virginia. Willie Parks, the architect involved, is a local fellow from increasingly soggy Pungo in Virginia Beach and one of the students leaders on our project in Chesterfield Heights. Exciting to see this. Backstory: A regional hub of innovative ideas, Global Shapers Norfolk, is looking at a novel solution to the problem of frequently flooded houses….houses that float above the rising tides. This novel idea involves an old friend of ours, Willie Parks, an architect working locally with RRMM Architects. Parks is no stranger to resilience design, having been a leader in the first resilience design efforts in Virginia. In the fall of 2014, Wetlands Watch partnered with a team of architecture students from Hampton University and engineering students from Old Dominion University in the historic community of Chesterfield Heights in Norfolk, Virginia, to see if we could come up with designs to flood proof that community. That award-winning project went on to earn a $120 million grant to revitalize the Ohio Creek Watershed. The work was a partnership involving Wetlands Watch, Virginia Sea Grant, Hampton University (Professor Mason Andrews), Old Dominion University (Professor Mujde Erten-Unal), Green Building Council-Hampton Roads, and numerous individual collaborators. It was the start of the Collaboratory, funded by the Adiuvans Foundation, to continue this work to match knowledge to need in solving our resilience problems. One of the goals of this work is to expose emerging professionals in the novel challenges that sea level rise and frequent flooding bring to coastal regions. Parks and Global Shapers are taking that challenge to new heights, above the rising tides. We wish them luck and congratulate Willie Parks. SNAPSHOT: In 2017, Wetlands Watch and its partners held a regional event to crowdsource flooding information, using the highest projected tide of the year (the so-called King Tide) as day of the event. We did it again in 2018 with new partners and an expanded focus. Now we are running the mapping year around, with neighborhood teams being organized across Southeast Virginia. BACKSTORY: In 2014 we developed a smart phone app that allowed people to map where it flooded in their community allowing them to take an active role in adaptation and flooding solutions. The app, “Sea Level Rise,” caught the attention of the environmental reporter for the Virginian Pilot, Dave Mayfield, who convinced his editors to sponsor a regional crowdsourcing event to collect flooding data around the “King Tide,” the highest of the fall perigean tides. The event was a success with over 700 mappers out mapping at the same time! So many in fact that we have applied for a Guinness World Record designation. So we did it again in 2018, this time with new partners at WHRO, the regional NPR affiliate. They developed lesson plans that meet state standards and received a grant to enroll over 120 high school classes in a year-long mapping effort. The 2017 effort brought out over 400 mappers, many of whom wanted to continue to map outside of the King Tide event. This is music to the ears of Dr. Derek Loftis, a researcher at the Virginia Institute of Marine Science who is using this mapping data to perfect his flooding models. He has been the primary user of the flooding data collected by these events but needs data collected at different times and in different areas. So now we are looking for funding to keep the work going year around, with mapping teams being organized across Hampton Roads. Snapshot: We hear from a lot professionals and government decision makers about what kinds of information and data they need in order to start implementing flood management/sea level rise adaptation measures. We also hear lots of ways we might find funding to start this work. We pulled this information together in one place to accelerate implementation. Backstory: As Virginia’s coastal communities move from studies and plans about flooding to putting those ideas into action, they are starting to find data gaps and needs that are impeding progress. Floodplain managers, local government planners, adaptation decision makers, and others along our shorelines began talking about these issues a while ago and there was a clear need to develop a comprehensive list of these data needs. With this list we could fashion a strategic approach to start ticking needed items off and also help set priorities for the new Virginia initiatives being proposed. But to be effective, any list had to come from comprehensive interviews with the stakeholders. The report is organized by category (data needed for planning, data needed for stormwater, etc.) and each data need also indicates which stakeholder reported the data need to enable users to connect with others sharing those suggestions. By listing the points of contatct for each organization in the back of the report we hope to facilitate this networking. As our shorline communities move to implementation, funding quickly becomes an issue. There is a similar need to develop a comprehensive list of potential funding sources for this flood management/sea level rise adaptation work. Virginia’s Coastal Zone Management Program saw these information needs as well and asked Wetlands Watch to conduct a review of critical data needs that had to be addressed, as well as a review of potential funding sources that could support implementation of projects along Virginia’s coastline. This recent study pulls that information together. This work needs to be done all along our coastline, so that we can begin to share resources and find ways to address the data gaps and maybe, just maybe, start pulling together the funding to implement solutions. Wetlands Watch is Finalist in National Resilience Competition! Snapshot: Wetlands Watch has been working on sea level rise adaptation for nearly a dozen years. We have a full adaptation agenda that includes practical approaches, like training the landscape professionals who will do the resilience work. We pitched that to the “Coastal Community Resilience Challenge” being run out of Norfolk, Virginia, and were one of 7 finalists out of 51 international proposals. Final pitch comes up in February. Backstory: Everyone talks about “nature based solutions” to flooding and stormwater management, but few think about who will do this work. Wetlands Watch has been working for nearly a decade on this issue, efforts that evolved into the Chesapeake Bay Landscape Professional (CBLP) program, a Virginia-Maryland effort to train and certify landscape professionals in nature-based practices. The CBLP trains and certifies landscape professionals from designers, to installation professionals, to landscape management crews. The program’s goal is to expand the trained workforce as demand increases for landscape-based/nature-based stormwater and flood mitigation approaches. As the CBLP grows and expands into other Chesapeake Bay states, we want to develop an intense effort in coastal Virginia, developing appropriate practices and training landscape professionals about them. With expanded certification we hope to develop a “brand” for the CBLP that will give certified professionals a preferred status in bidding for work, given their ability to insure performance and sustainability of the installations. One special aspect of our proposal is the use of the “CBLP-A” apprenticeship program, where we bring new, younger practitioners into the profession in an apprentice training program. The other element we are excited about is using our university-local government partnership program, the Collaboratory, to bring academia into this area of development. We are preparing our final “pitch” now and hope to be successful in February. Snapshot: Norfolk has rewritten its zoning ordinance to make it more “resilient.” Key to this novel approach is a scheme to reward developers who take flooded property and put it into a land trust, fostering an orderly retreat for frequently flooded properties. Wetlands Watch wants to figure out the details, make this work in Norfolk, and then export it along the coast. Backstory: As we reported, the City of Norfolk, Virginia, spent the last three years rewriting its zoning ordinance, the operating plan for how people develop and do business in this coastal city. We were part of a team helping the city and feel the ordinance is novel in a number of respects, raising resilience standards for development across the city, establishing a novel point system of actions required before development can occur, combining the 10-year floodplain and the 500-year floodplain in a "Coastal Resilience Overlay" (CRO) district with special conditions for development. 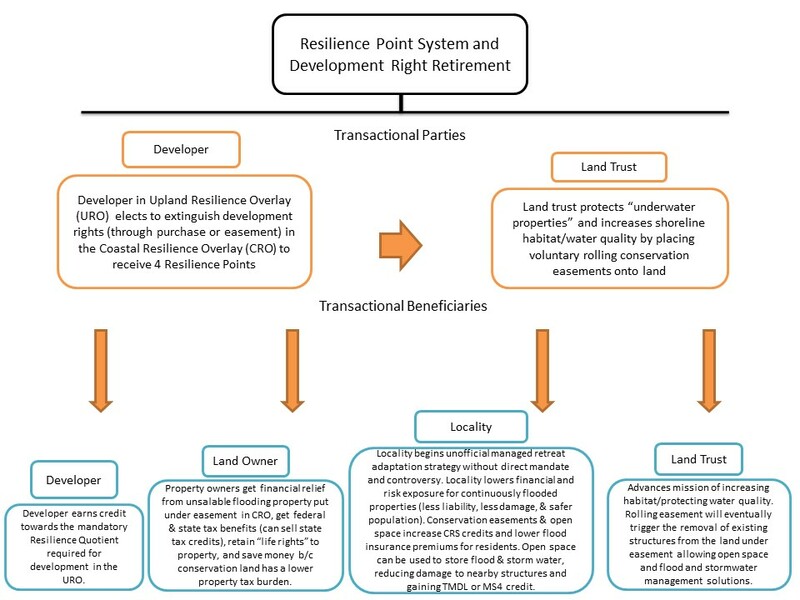 But the most novel of the changes is the emergence of a development option that awards resilience points to a project being planned in the higher parts of the city ("Upland Resilience Overlay") if it extinguishes development rights in the CRO. Under this provision a developer would buy a property in the CRO (or purchase the development rights only) and then transfer it to a land trust. This transaction is a private arrangement between the developer, the property owner in the CRO, and a land trust. The land would be put into a conservation easement, allowing the property owner to take advantage of federal tax deductions and state tax credits. Wetlands Watch is working with the Elizabeth River Project’s Living River Restoration Trust (LRRT), a new urban land trust working along the Elizabeth River. The LRRT is a partner in this work and is developing a critical role in the restoration of an urbanized shoreline in Southeastern Virginia and adding this forward-looking adaptation component. We recently made a presentation on this proposal that explains more completely what we envision. Increasing numbers of shoreline property owners are trapped in their homes, unable to sell them at market value due to high flood insurance premium costs or recurrent flooding that becomes a known problem for the property. This Norfolk zoning provision provides some escape for those properties and allows the owner to extract much of the invested value in direct payment from the developer and in the form of tax deductions and credits. There is much complexity in these transactions, however, and much uncertainty. This arrangement has not been tried anywhere in the country so some adjustments, tweaking, and changes will be needed. For the parties involved, there will need to be more certainty about the economics of the transaction before this comes into widespread use. Wetlands Watch also wants to have these arrangements contain “rolling easements,” provisions for triggering abandonment of the property when certain natural/flooding/flood loss conditions are met. We are seeking funding for a two-year project to develop this work into a pilot demonstration that we can move into other Virginia communities and then along the entire US coastline. Snapshot: As we have discussed before, there are too many sea level projections being made without enough guidance on which one(s) to use. The Hampton Roads Planning District Commission (HRPDC) has approved a guidance for localities in Southeast Virginia, one of the few regions in the country to do so. Backstory: For local governments looking to start sea level rise adaptation implementation, a major challenge exists: what projections of sea level rise are appropriate for the adaptation project? Government agencies and academia have produced a confusing array of projections that, rather than driving adaptation, actually delay it. We have heard from local governments facing this challenge that they would rather wait until there is consensus or until the state government picks a curve. Even that action has risks. Choose a curve with too low a rate of sea level rise and the adaptation project will fail to produce the expected protection. Choose a curve too high and scare resources are wasted. Wetlands Watch has been arguing for a set of recommendations to be made, seeing localities starting to turn plans into action along the shoreline. Now our own home region has taken that step, with a set of recommendations for localities in southeast Virginia to use in their flooding mitigation work. This is one of the few concrete actions taken in the country to address this need and the HRPDC is to be applauded for this first step. The guidance states we can expect about 1.5’ of sea level rise by 2040, 3’ of sea level rise by 2070, and 4.5’ of sea level rise by 2000. This action will also help the state as it struggles with this issue in the recently-issued Executive Order on Sea Level Rise. Snapshot: “Measure the Muck,” citizen science water monitoring program in Virginia, reveals new pollution threats from nuisance flooding. One flood day’s nutrient load equals an entire year’s projected pollution! Backstory: For the last two years, a citizen science effort has been held to measure the extent of flooding on the highest projected tide of the year, the so-called “King Tide.” At the same time, another citizen science group has been our measuring as well - not where the water goes to when it floods, but rather what the flood waters bring back into our creeks and rivers when they recede. The work is led by Old Dominion University Oceanography Professor, Dr. Margaret Mulholland, using students from the university as well as regional high school students to take samples. Hampton Roads Sanitation District provided support for the sample collection and processing. The results from 2017’s sampling even are in - bacterial counts extremely high and nitrogen pollution off the charts as well. The preliminary results show that in the one day’s flooding, the total nitrogen pollution load to the Lafayette River was equal to an entire year’s loading as predicted by the regulatory model. The models do not take these extreme events into account, nor do they take the impacts of flood waters bringing pollution back into our watersheds. This work is being replicated but these early results show yet another impact from these higher tidal waters that are inundating coastal communities. Snapshot: Virginia Governor Ralph Northam issued and executive order on sea level rise and resiliency that will result in a statewide plan to address our coastal flooding issues. 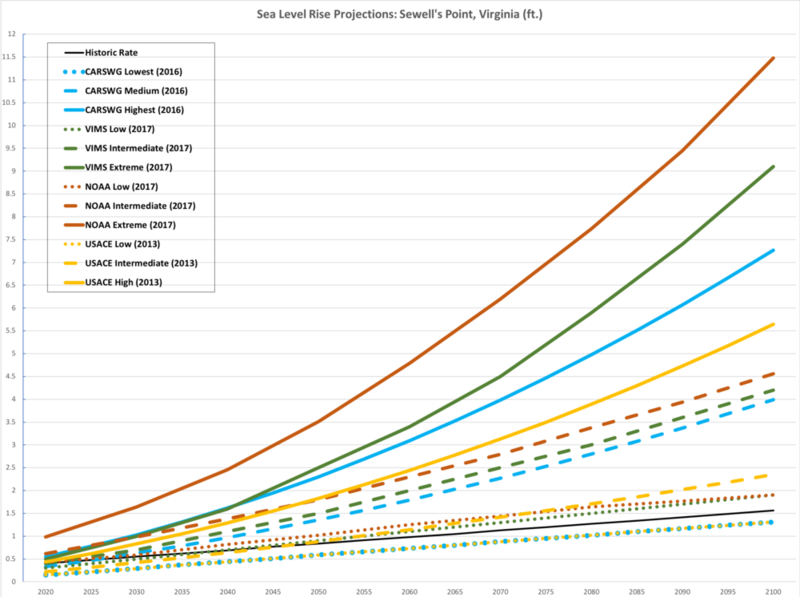 Backstory: Virginia has finally stepped up to deal with its sea level rise and resiliency challenges, one of the few states developing a comprehensive coastal strategy. On November 2, 2018, Governor Ralph Northam issued Executive Order #24, ““Increasing Virginia’s Resilience to Sea Level Rise and Natural Hazards,” setting out the actions that Virginia will take in coming months to put together a state response to sea level rise. The Executive Order has the state look at its building and determine their vulnerability and set standards for new construction going forward. There is a review of the state’s pre-disaster mitigation programs and guidance for localities on sea level rise projections and freeboard (additional elevation above the flood plain) guidance for new construction. Wetlands Watch has been providing assistance to the administration officials working on this executive order and just secured a grant to continue this work. Update: City of Virginia Beach gets sued over its decision to deny a subdivision due to future flood risk. Back in April, the city of Virginia Beach told a developer “no” when they wanted to rezone land to build a subdivision on soggy property that was going to get worse with sea level rise/increased rainfall. This was the first time we could identify a local government decision based on FUTURE flood risk. At the time, we worried that the developer was going to sue the City over this. Well, it happened. The developer will be in court this week to challenge the decision. They contend that the city, in asking them to account for higher rainfall and sea level rise standards in their designs, is acting outside of local and state regulations. The developer is correct in one respect: Virginia’s laws and regulations are silent on rates of sea level rise and increased rainfall intensity, leaving localities to fend for themselves, as Virginia Beach tried to do. The City was concerned not only that the subdivision would flood, as other subdivions in the area have, but that the only entrance road will be underwater as well. The developer’s supporters say that it's not the private company's job to raise the road, implying that the taxpayers of Virginia Beach will get stuck with the bill for that work after the developer has built and moved on. When you’re in a hold, quit digging, as the saying goes. Virginia Beach is tired of being put in a hole. In 2008, then-Governor Kaine appointed a Commission on Climate Change to study the impacts of climate change on Virginia and to outline the ways we need to respond. The Commission issued a report that outlined a consensus action plan for Virginia. The Commission's work languished, a subsequent Governor had it removed from the state's website (Wetlands Watch obtained the source code and reconstructed it on our server.) The last Governor convened a Commission to review the situation but little came of that effort. Now we have a new Governor, Ralph Northam, who was actually a member of the 2008 Commission on Climate Change, and he is very interested in taking on some of these nagging issues. In fact, he was the author of legislation that enacted two of the provisions in the Commission's recommendations on adaptation to sea level rise. Planning for Sea Level Rise? Guess Which Projection Works Best. If you're seeking guidance on which of these sea level rise projections to use....good luck! Snapshot: We are seeing an array of sea level rise projections that vary widely. The only advice being given to adaptation project designers is “Pick one.” Virginia’s coastal communities need better advice than that. Wetlands Watch is pressing for some action. Backstory": After years of planning and study, Virginia's coastal localities are starting to implement adaptation strategies and develop resilient infrastructure in the face of the highest sea level rise on the Atlantic Coast. However, as these efforts started moving forward, we noticed a variety of estimates of sea level rise rates being used. Even within the federal government - even within the Department of Defense - there were different estimates being used for different projects in the same city. We took a little time to document this and sure enough there is a range of projects being designed to different rates of sea level rise. In a region that is so interconnected that is a problem. Not that everyone has to use the same projections for every type of project, but there should at least be some general guidance on how to go about wisely spending taxpayer dollars in these adaptation projects. The federal government bailed on any attempts at guidance when the Obama-era flood standards were junked just before Hurricane Harvey hit Houston. The state of Virginia has never offered guidance. In fact it does not consider sea level rise in any of the state's infrastructure investments or regulatory programs. Wetlands Watch wants to change that. Other states and regions offer guidance on rates of sea level rise. We want Virginia to join that effort and are seeing opportunity in the emerging resilience initiative pushed by Governor Ralph Northam. Expect some action on this problem in coming months. City Says "No" to Development Because of Flood Risk - First of a Kind! 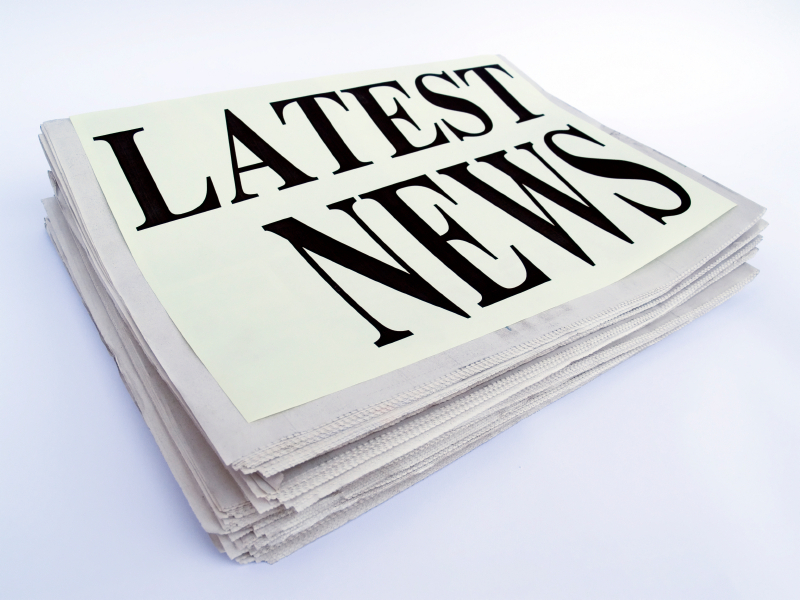 For the first time that we can find, a local government has said "no" to a development proposal due to flood risk. The City of Virginia Beach, hammered by increasing rainfall, has been more sensitive to the flooding potential, especially in the low-lying southern part of the City. But lots of localities are concerned about and planning for flooding, but still allow people to develop in dangerous places. No more in Virginia Beach. The City Council unanimously denied a proposed 23-home subdivision on a soggy piece of land because of concerns about flood risk and future city liability. Recently burned by the flooding in a recently constructed subdivision, Ashville Park, Virginia Beach Planning Commission and City Council members expressed doubts about this proposal. Even though it met the technical requirements, the access roads flood frequently, flooding will increase, and the city did not want to put more people in harm's way. This follows on the City's work to document the increased rain flooding risk that is equally important and groundbreaking. Stay tuned for lawsuits and negotiations, but for now the City of Virginia Beach is the first in the country to say "no" to soggy development proposals. Snapshot: Stunned by the rainfall flooding from Hurricane Matthew, the City of Virginia Beach contracted for a study on historic and projected rainfall for the City/region. 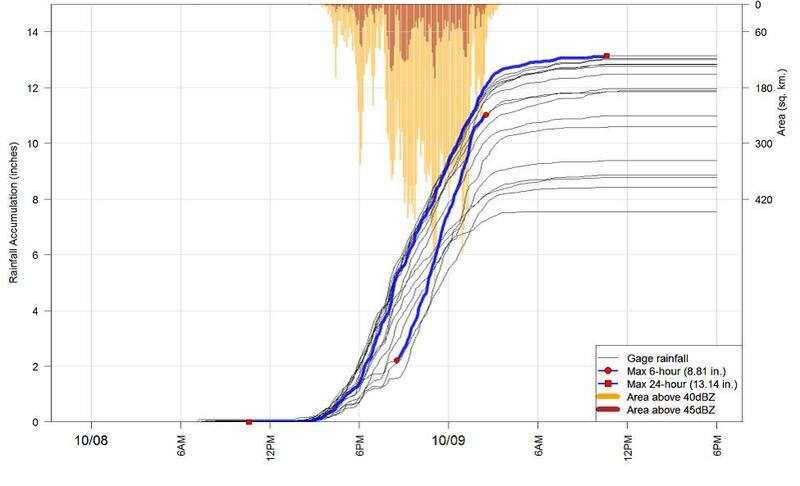 The study verified what many of us have suspected: rainfall is getting more intense. The City is looking to have stormwater practices and subdivision stormwater systems take this new rainfall record into account. While state and federal authorities use decades-old data to set stormwater standards and practices. Virginia Beach would be the first locality in the Nation to build future flood risk from rainfall into its codes and ordinances. Stay tuned for updates on this innovative work! Background: People in SE Virginia have been commenting that we have been seeing more intense rain in recent years, those down bursts that dump two or three inches of rain in a short period. Sometimes you get caught in them and become trapped in your car and watch the storms spew pollution onto the streets and into the rivers and bays. The big moment of realization was during Hurricane Matthew when some areas in Southeast Virginia saw more than a foot of rain in 12 hours - displayed on the graph above. Many areas of the region flooded and many had never flooded before. In response, the city of Virginia Beach examined rain gauge records and saw a pattern of increasing intensity. They asked the consulting firm, Dewberry, to do a comprehensive study of rainfall patterns and the result was a confirmation of the observation: the number of intense rainfall events is increasing. Combine more rain with the increased tidal flooding we are also experiencing and there are compounding problems. Now the city is looking at the next steps - including a stormwater ordinance that anticipates the 20% increase in rainfall intensity found in the Dewberry study. This would be the first stormwater ordinance in the country that anticipates a higher rate and intensity of rainfall. One of the barriers to more cities taking steps to deal with increasing rainfall intensity is Virginia stormwater standards are set to the rainfall estimates contained in the NOAA Atlas 14. This document was last updated in 2006 and is based on rainfall data from decades before that time. The Virginia Beach study looked at more recent set of rainfall data in coming up with its higher rainfall frequency/intensity numbers. While state regulations allow a locality to enact more stringent stormwater standards than those based on NOAA Atlas 14, as Virginia Beach is proposing, they must have data to support such a move. For localities without Virginia Beach's resources, this means they are left using the decades-old rainfall estimates in Atlas 14 to design stormwater management systems and practices. NOAA needs the resources to update its Atlas 14, especially in areas that have seen these "rain bomb" events - Hampton Roads, Charleston, Houston, etc. Since this is going to take years, the state needs to act now, developing newer rainfall estimates for use by localities so they don't have to do this one-by-one and ask for variances. (Postscript 7/2018) - There is growing interest to explore the possibility of a cooperative agreement with NOAA to have the state or a group of local governments pay for the update of the NOAA atlas for Virginia. Also, the administration of Governor Ralph Northam is interested in this issue and looking into it. SNAPSHOT: A new study from NOAA projects increases in high tide flooding onto streets and sidewalks in shoreline communities. These floods will occur every other day - possibly every day - by 2100 even using very conservative sea level rise estimates. Given the time and money required to mitigate the damage from this constant flooding, we need to start yesterday to put adaptation measures in place. BACKSTORY: Anecdotally, Wetlands Watch has been hearing for years that tidal water levels seem to be increasing. At community meetings and service club talks, we heard more complaints that tidal waters were lapping over roads and sidewalks and coming up out of stormwater pipes and ditches. We observed changes in rural ditches in Mathews County, ditches that were dry when we started working up there in 2008 and now are full of water most days and have tidal wetlands plants growing in them. We have documented this nuisance flooding in urban areas. Projections for Downtown Norfolk, VA by Dr's. Tal Ezer and Larry Atkinson of Old Dominion University. 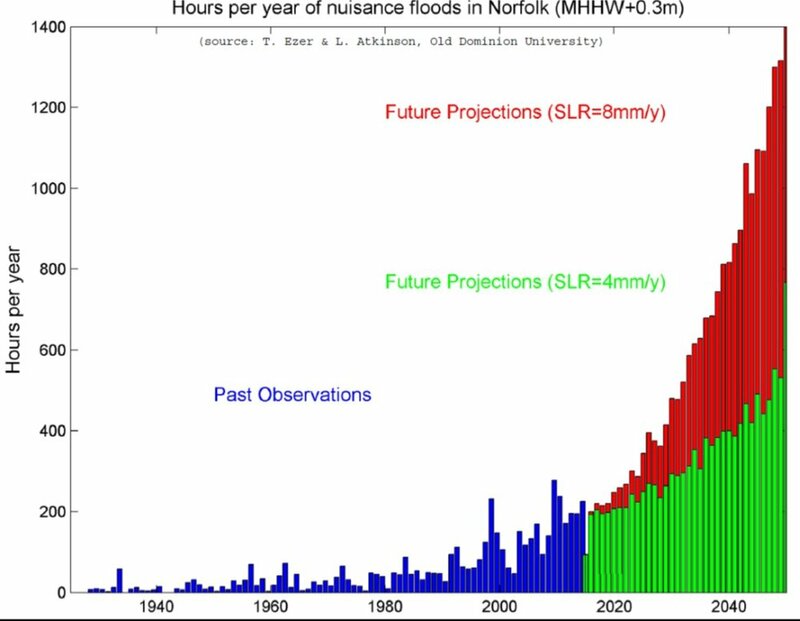 In the graph above, two oceanographers from Old Dominion University in Virginia developed projections of future nuisance flood risk. The blue in the graph is the observed flooding (hours per year) since the tide gauge at the Norfolk Naval Station was put into service in 1927. The green bars in the graph are the projected flooding hours/year with the current rate of sea level rise. The red bars are the projected flooding hours/year with the accelerated rate of sea level rise we are seeing, about twice the current rate. Solutions? Start today with detailed maps of where flooding will occur. Take extra precautions to build "freeboard" or additional flood protection into local land use actions or federal investments along the coast. Start developing comprehensive plans among all the stakeholders - public and private - to address the flooding. Oh, and we need to start stacking up the dollar bills needed to pay for all the work we have to do. Snapshot: Community level adaptation strategy and design work continues in another Norfolk neighborhood, building on efforts over the past four years. Students meet residents to fashion stormwater and flooding solutions. BACKSTORY: The Poplar Hall neighborhood in Norfolk is the focus of another community-scale adaptation effort, continuing the partnership between Wetlands Watch, The Elizabeth River Project, University of Virginia's Resilience Capstone students (led by Dr. Phoebe Crisman), and the City of Norfolk. Another waterfront community along the Broad Creek tributary of the Elizabeth River, Poplar Hall was built out in the late 1950's and has stormwater pollution and flooding issues that need fixing. Working with the community, the Team will come up with some approaches to dealing with the water issues here. As with the work in Ingleside, we hope to develop some grant proposals to put the designs and strategies on the ground. Snapshot: Here we go again...strong storm shows we have put houses where they shouldn't be but also shows how much money is at stake and what's aligned against Smart Coastal decisions. BACKSTORY: The houses being washed away in the photo above (courtesy of Ralph Karl Swenson) are in a place named Peggotty Beach outside of Scituate, MA. The March 2018 nor-easter slammed this area and flooded this sand spit. The second image in the gallery is an overhead view that shows how precariously these houses are placed - on a sand spit between tidal marshes and the open ocean. So when the nor'easter hit, the spit was overwashed, filling the marshes behind the houses which are draining back into the ocean in the first picture . See that nice house in the center of the first picture? The last picture is the ad for the house on a rental website. The house goes for $9.650/week in season and comes with a housemaker. That's a nice setup that would be hard to walk away from and expensive for government to buy out. The reality is these houses will sit there until they get knocked down and even then it might not be over. Six flooded rentals in Nags Head were allowed to stay for over four years, through court cases, until the city bought them out. As long as the owner can get nearly $10,000 a week in rental fees, it will be hard to tell people to not build in dangerous places.